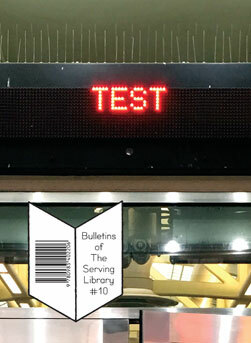 BULLETINS OF THE SERVING LIBRARY #10 is a *TEST,* containing one choice bulletin from each of the previous nine issues. It is a compendium of sorts, a best-of double-album printed at 50% scale, a sample for what's next. This issue also includes 140-character summaries of every bulletin we have published previously in the printed journal and online and so serves as a retroactive portrait of the library we are busy assembling. From now on, Bulletins of The Serving Library will proceed in full color and at half its former size—but will be twice as good.